There are a multitude of neuronal populations throughout the brain that have been identified for having a role in controlling appetite, however, it is still not known how these brain regions integrate information from past experiences and the environment to regulate feeding behaviours. The authors hypothesized that the hippocampus may be important for the integration of this information since it is well established as a brain structure that is important for spatial location and memory formation. Further, more recently, it’s its dysfunction has been shown to alter food intake. This week in the Neuron, Azevedo and colleagues investigated the role of the hippocampus is regulating food-related behaviours. The authors expressed either an inhibitory (hM4Di) or excitatory (hM3Dq) designer receptor exclusively activated by designer drugs (DREADD) in glutamatergic cells in the dorsal hippocampus of wild type mice. They activated either the inhibitory or excitatory DREADDs by infusion of clozapine-N-oxide (CNO) and observed changes in food intake over a 24-hour period. Next, the authors used PhosphoTrap (which can profile gene expression based on changes in neuronal activation) to measure hippocampal gene expression in fasted mice that underwent a behavioural task where food was presented in a context-specific manner. Next, the authors investigated the role of hippocampal dopamine receptor D2 (Drd2) neurons in food intake by performing bilateral injections of a virus containing either a Cre-dependent inhibitory or excitatory DREADD in the dentate gyrus (region of the hippocampus) in Drd2-Cre mice. They activated the inhibitory and excitatory DREADDs with infusion of CNO and measured food intake acutely (24Hr) and chronically (8 days). Then, they used multiple viral constructs (anterograde and retrograde tracers) to identify synaptic inputs onto hippocampal Drd2 neurons as well as synaptic outputs from hippocampal Drd2 neurons. 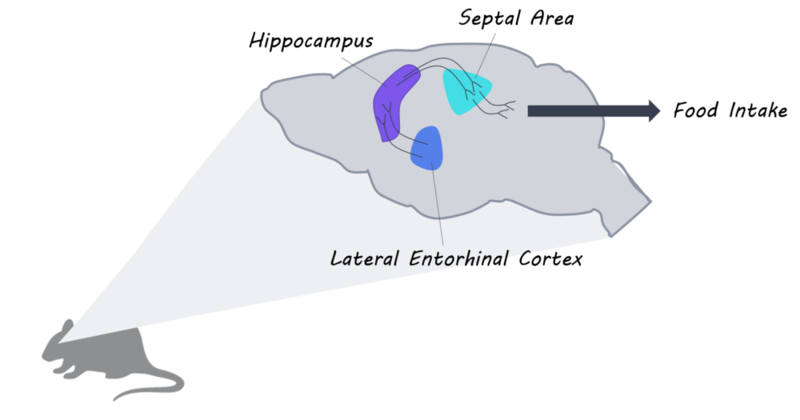 Next, they targeted Channelrhodopsin-2 (a light-gated cation channel) to glutamatergic neurons in the lateral entorhinal cortex (which projects to hippocampal Drd2 neurons) and implanted optical fibers above the lateral entorhinal cortex terminals in the dentate gyrus (where Drd2 neurons are located). Similarly, they targeted the expression of either Channelrhodopsin-2 or Archaerhodopsin (an inhibitory light-gated ion channel) to hippocampal Drd2 neurons and implanted optical fibers above neuronal terminals located in the septal area. Finally, they measured changes in food intake in response to activation of synaptic inputs onto hippocampal Drd2 neurons or activation/inhibition of synaptic outputs from hippocampal Drd2 neurons. The authors found that chemogenetic inhibition of hippocampal neurons increased food intake over a 24-hour period, while chemogenetic activation of hippocampal neurons decreased food intake. These data suggest that the dorsal hippocampus contains a population of glutamatergic neurons that are involved in regulating food intake in mice. Next, the authors determined that fasted mice presented with food showed significant enrichment of Drd2 in neurons located in the dentate gyrus compared to mice that were not presented with food, suggesting that hippocampal Drd2 neurons may be involved in food-related behaviours. The authors determined that in fasted mice, both acute and chronic inhibition of Drd2 hippocampal neurons increased food intake, while acute and chronic activation of these neurons decreased food intake. Together, these findings suggest that Drd2 in the hippocampus is important for regulating food intake. The authors found that Drd2 hippocampal neurons receive inputs from neurons in the superficial and middle layers of the lateral entorhinal cortex and send projections to the septal area (medial and lateral septum). Finally, they determined that optical activation of neurons in the lateral entorhinal cortex (projecting to hippocampal Drd2 neurons) and hippocampal neurons (project to septal area) decreased food intake in fasted mice, while optical inhibition of hippocampal Drd2 neurons increased food intake in fed mice. Altogether, these findings suggest that the activation of the lateral entorhinal cortex-hippocampal Drd2 pathway plays an important role in suppressing food intake. This is the first study to identify that food cues increase the neuronal activity of hippocampal Drd2 neurons. Additionally, the authors revealed that hippocampal Drd2 neurons receive inputs from the lateral entorhinal cortex and send projections to the septal area, forming a circuit that is important for regulating the suppression of food intake. Together, these findings provide a better understanding of the brain circuitry that is critical for mediating food-related behaviours. Azevedo et al. A Role of Drd2 Hippocampal Neurons in Context-Dependent Food Intake. Neuron (2019). Access the original scientific publication here.